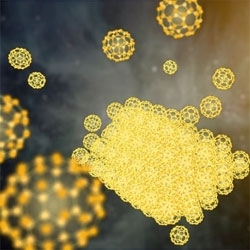 Scientists discover Buckyballs (microscopic spheres, where 60 carbon atoms are arranged in a football-like pattern) in a solid form, around a pair of stars some 6,500 light-years from Earth. 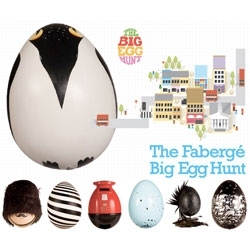 FEATUREDLondon has become home to over 200 eggs as part of The Big Egg Hunt presented by Fabergé. 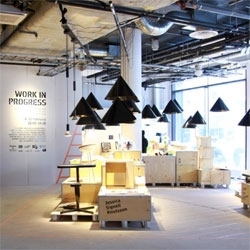 Take a look at the gorgeous identity work by Fallon, fun pop up shop in Selfridges and a few of our favorite eggs! 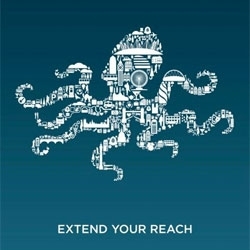 VIDEOKyle McDonald collaborates with YCAM to create ProCamToolKit, Guest Research Project vol.1. 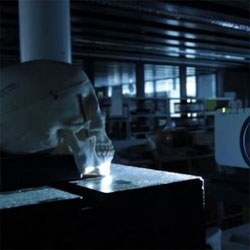 'Projector camera toolkit' w calibration, and position/color adjustment technology required for large-scale projections. 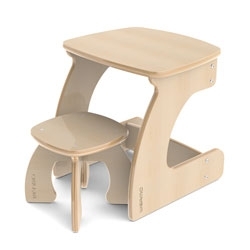 Cute kids furniture from Weamo. 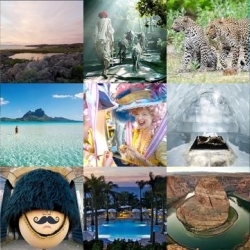 FEATUREDCountry houses in Ireland, diving in Fiji and a giant egg hunt in London are all part of this week's roundup from Notventures. 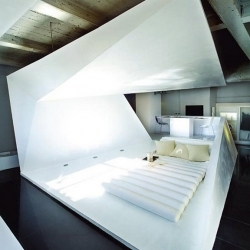 L / M / N / series by Valentin Bussard. 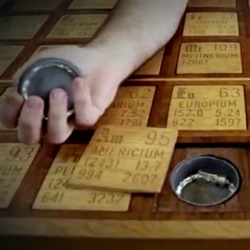 VIDEOThe wooden Periodic Table Table by Theo Gray, a Wolfram co-founder, holds his nearly complete collection of elements in style. 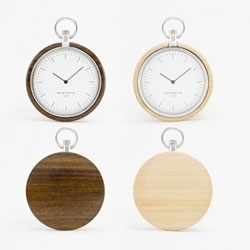 Hong Kong denizens Jeremy and Baptist Guedez in partnership with their designer friend Thomas Letourneux create the newly designed Memento Pocket Watches. 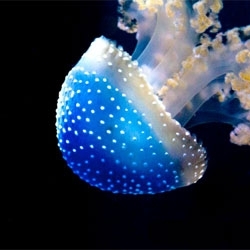 FEATUREDIncredibly beautiful Australian or white-spotted jellyfish (Phyllorhiza punctata) at the California Academy of Sciences almost look like little swimming blue toadstools! A mushroom farm inside a Seattle storefront repurposes the city's discarded coffee grounds as compost and teaches locals about urban agriculture. 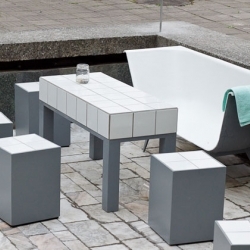 Social space in East Europe, furniture made from old refurbished baths, lighting from showers. Project realized in abandoned Soviet Union fountain. 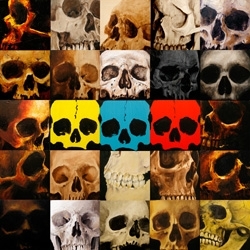 #26-50 of the 100 Painted Skulls project by Skull-A-Day's Noah Scalin. 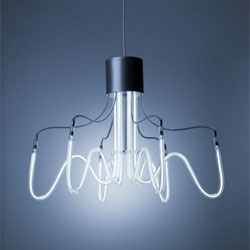 Underworld. Commissions 2010-2012. 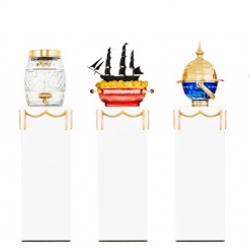 Studio Job invites you to their new exhibition. 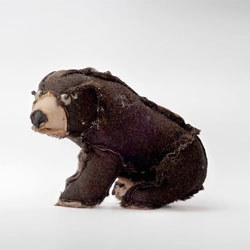 Outsiders, an interesting project from Atelier Volvox that turns stuffed animals inside out. 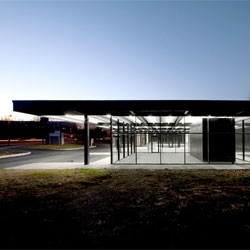 A former gas station turned Youth Activity Center on Nun's Island by Les architectes FABG. CBS Outdoor UK's "Outdoor By Name, Urban By Nature campaign" in London by Clinic. 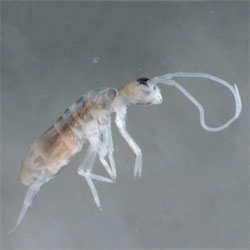 This unassuming little springtail, Plutomurus ortobalaganensis, is a newly discovered species which now holds the record for deepest living underground invertebrates at 1980 meters. 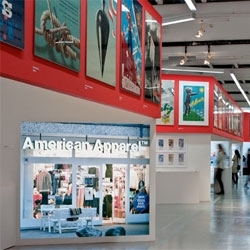 100 Years of Swiss Graphic Design at the Museum für Gestaltung Zürich. 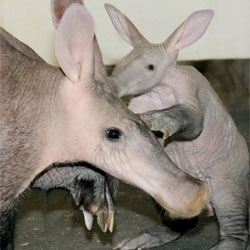 Chicago's Brookfield Zoo celebrate the new arrival of an Aardvark calf. 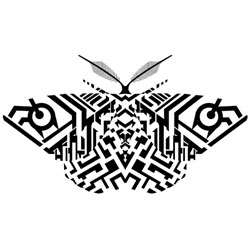 zeroh's Hastings Moth Project, working with Hastings Borough Council to bring clean graffiti geometric prints of Sussex moths to the streets of the borough. 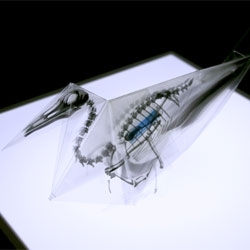 'Oritsunagumono', Takayuki Hori’s incredibly beautiful x-ray origami animals. 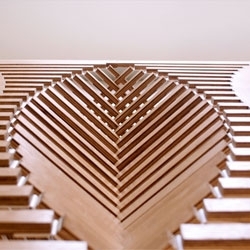 Robert van Embricqs' "Rising" furniture series pops up from flat forms. 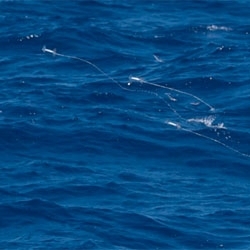 New research suggests that squid may fly to save energy. Many species have been seen to 'fly' using the same jet-propulsion mechanisms that they use to swim: squirting water out of their mantles so that they rocket out of the sea and glide through the air. VIDEOBeat 2012. Mark Ronson's Olympic soundtrack composed of athlete's noises. 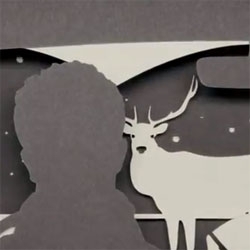 Created by Somesuch & Co., directed by Kim Gehrig. 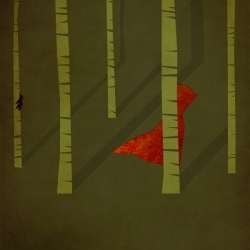 Minimalist Fairy Tale Posters by Christian Jackson. 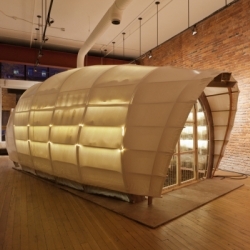 This amazing 'Folded' Crib from G&R Studio is designed by Hector Ruiz-Velazquez and Javier Garcia. 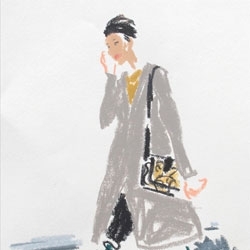 London fashion week captured in quick sketches by Damien Florébert Cuypers. Introducing 'N-Joystick' the world's 1st mouth operated joystick. 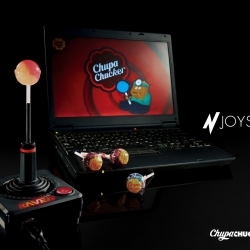 Designed to deliver a uniquely delicious playing experience, the N-Joystick allows users to a slot Chup Chups into the shaft and use their mouth to control the action. 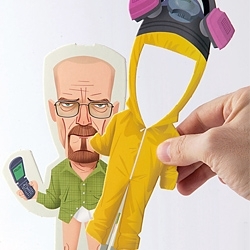 'Trimdoll' is an awesome collection of pop culture paperdolls created by illustrator Andrés Martínez Ricci. The first two in the series are Don Draper from Mad Men and Walter White from Breaking Bad. 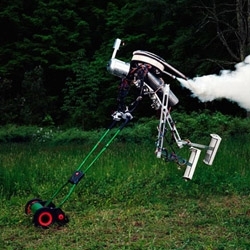 A series of ominous photos by Thomas Jackson about the life of a robot. 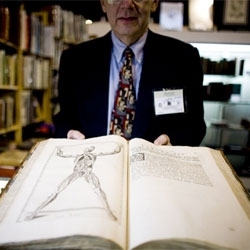 Wired Science captures some gorgeous pieces of the history of science at The San Francisco Antiquarian Book, Print and Paper Fair. 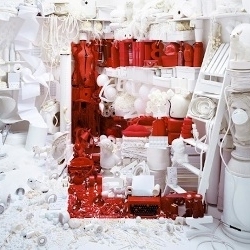 'Letter E' installation by self-taught Yorkshire artist, Nicola Yeoman. 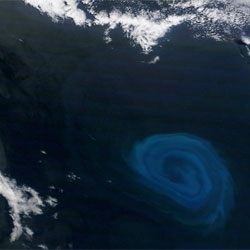 New Scientist on huge oceanic eddies, 150km wide. Stunning image captured by NASA's Terra satellite last December. 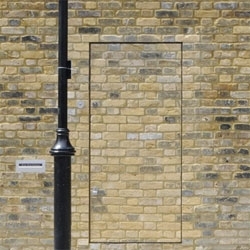 Architect Jack Woolley's 'Old Warehouse' has its entrance camouflaged into an old brick wall. 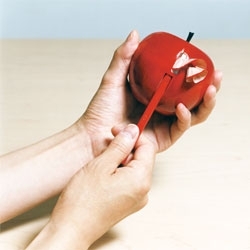 Apple shaped pencil sharpener from rabbithole. 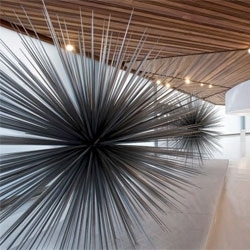 The Polyforum Siqueiros Galleries in Mexico City renovated by BNKR Arquitectura. 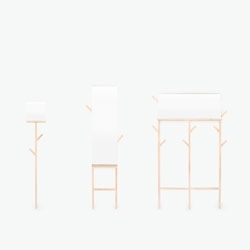 Work in Progress, an exhibition concept initiated by Jonas Wagell and Axel Bjurström at Stockholm Design Week. 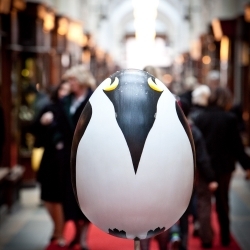 Penguin egg by Robinson Pelham at Burlington Arcade, embedded with Swarovski crystals, is part of London's The Faberge Big Egg Hunt. 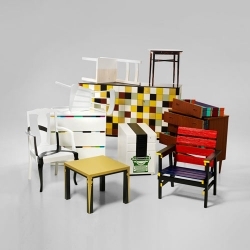 Paint manufacturer Alcro challenged ten students from Beckman’s College of Design to breathe new life into old pieces of furniture, using nothing but a lick of paint. 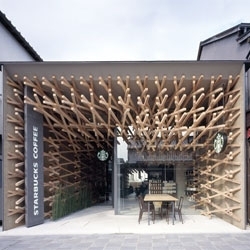 Kengo Kuma's interior for Starbucks in Fukuoka, Japan. 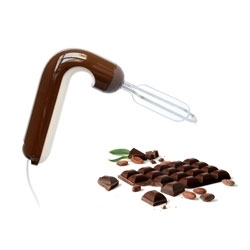 Meike Harde's beautifully streamlined conceptual handmixer design, Quix, inspired by chocolate! 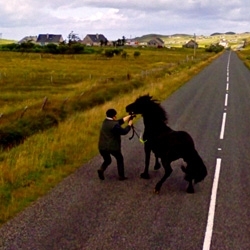 Jon Rafman's The Nine Eyes of Google Street View is a photo project documenting some of the stranger photos captured by Google. 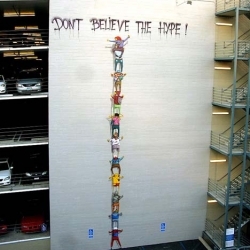 Some scary, some beautiful, but all of them are unique. 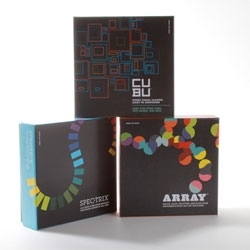 Funnybone toys' card games that foster an appreciation of color: Array, Cubu and Spectrix. 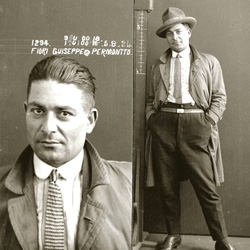 This photo collection of mugshots from the 1920s in Australia is amazing. They certainly do not take mugshot portraits like this anymore. 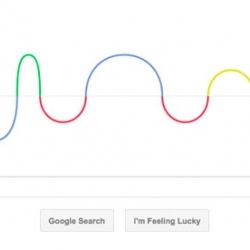 Google Doodle celebrating german physicist Heinrich Rudolf Hertz.